Walmart (s wmt) is ramping up its mobile strategy and releasing a new iPhone (s aapl) app that provides a number of features aimed at improving the shopping experience for users, who are increasingly interacting with the retailer with mobile and social tools in addition to traditional in-store visits. The new iPhone app comes fresh off the heels of Walmart’s first iPad app, which was introduced late last month, and it shows where the company is heading now that it’s rolling all of its mobile products into its new @Walmart Labs. 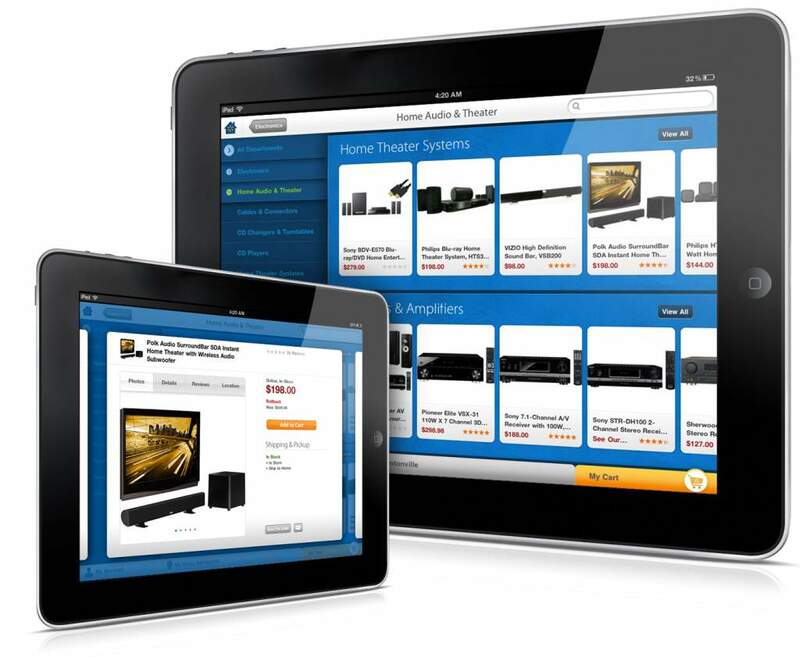 It’s also just in time for the holidays, which are going to be huge for mobile commerce. The new iPhone app, which should be available in the next few days, packs in a number of features, including a new smart shopping list tool that allows people to speak their shopping list into their phone to create a list. Users can also create a list by scanning a barcode or typing in products. The shopping list, which can be shared by email, can be paired with a new budgeting tool that pulls up real-time prices for products, so consumers can calculate their bill ahead of time. And they can grab manufacturer coupons for the items on their list or find other coupons for products at Walmart. Users will need to print out the coupons from an email. 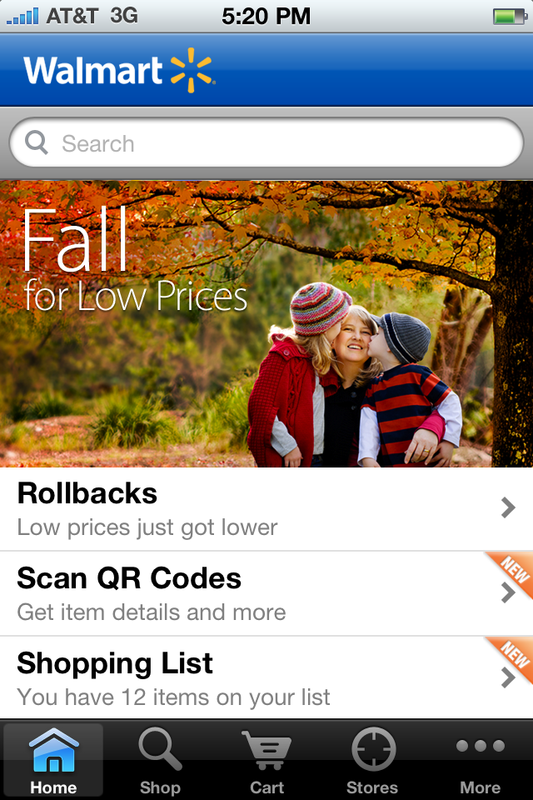 Walmart will enable users to pull product information — including reviews, ratings, price and availability — from the app. They’ll also be able to scan QR codes for information. In a test in a limited number of stores, Walmart will provide a store item finder tool that tells people the exact location of products. It can work with a smart shopping list, which can organize the products by their location. The recently released iPad app is designed specifically for a more casual browsing experience. It provides users with a view on the right side of the best recent deals and it let’s users drill down to get more detailed product information. There’s a mode that lets you browse one specific store so the items are organized first by products you can buy at a user’s favorite location. The products are part of Walmart’s efforts to ride the big shift in commerce as the introduction of mobile and social upend the way consumers buy things. Increasingly, shoppers come into stores armed with smartphones while others hunt at home on tablets, guided by recommendations from friends on social networks. Walmart is trying to get ahead of that and address all the different ways people want to shop, whether it’s in store, online or out and about while on a mobile device. They’re also trying to use mobile to help provide people with more self-serve tools and deliver more more personalized experience. “Mobile gives us an opportunity to bust up the ideas of channels and create a seamless experience for consumers,” said Paul Cousineau, Walmart VP of mobile products. It’s interesting to see Walmart exposing more of its data to help consumers. This can be tricky for a retailer but it’s helpful for consumers to see in-store inventory and real-time pricing. I think it’s still early in this epic transformation of commerce. But companies are going to have to be smart about how they leverage all these new and disruptive tools in the hands of consumers. Increasingly, consumers are empowered by mobile and social, and companies need to keep up and provide great shopping experiences that incorporates all the ways people want to search, research and buy. We’ll be discussing more about the future of commerce with Venky Harinarayan, SVP of Walmart Global eCommerce and Head of @WalmartLabs at our inaugural GigaOM Roadmap conference Thursday in San Francisco. For shopping (groceries, or really anything) we use “Which Aisle”. You can add your own products or use the built-in ones. It even tells you which aisle numbers the stuff is in. http://www.itwire.com/your-it-news/mobility/49123-woolies-on-a-winner-with-iphone-app um be interesting to compare this app with Walmart. Do the Aussies beat the Yanks? I like those apps that not only keep your shopping list, but even tell you which AISLE the product is located in, right in the store you are in at the time. I have no idea how it does all that, but it does.